A prominent Ridgefield businessman for a half century, B.E. “Bert” Sperry died amid much family sadness. His business also ended with a bang. In the fall of 1946, Sperry drove to Michigan to visit his brother, Frank, who had been hospitalized with burns suffered when a relative’s house burned down. Frank had been staying at the relative’s house after a fire had destroyed the trailer he himself had been living in with his brother, former Ridgefielder Fleet Sperry — Fleet was burned to death in that blaze. On the day before Halloween, Bert Sperry suffered a heart attack at a Ohio hotel and died. 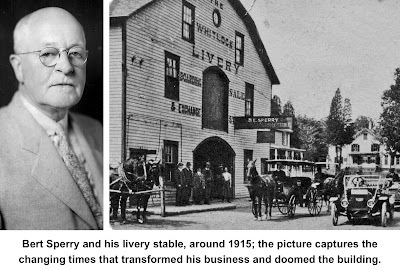 Born in 1871 in Michigan, Bert Eugene Sperry came to Ridgefield in 1892 and worked at the Adams and Keeler livery stable. Five years later, he opened his own stable in a huge building on Catoonah Street that had been Whitlock’s livery stable. He had as many as 75 horses at one point. Sperry handled in an effective way the arrival of the automobile and the departure of the horse. He continued in the taxi business until World War II and also sold coal and wood. Sperry was active in the Lions Club and other local groups. Sperry’s livery stable was a huge edifice that stood opposite the Ridgefield firehouse. It was built to hold not only horses that could be rented or boarded, but carriages that could be rented with horses for use like an Avis car or U-Haul truck today. Upper floors held large amounts of hay to feed the horses and provide bedding. When the horses left, the three-story barn, built probably in the 1870s, became obsolete and for some years had been poorly maintained. It was showing its age and perhaps lack of maintenance in the winter of 1947-48, when a couple of big snowstorms in late December and early January had piled huge amounts of snow on the roof. The building began creaking and sagging. Fire Marshal Horace A. Walker condemned the structure (there was no building inspector back then) and ordered the Harry Dodson family, who had an apartment in the rear section, to get out and take anything of value with them. At 4 o’clock on the morning of Jan. 17, 1948 — 12 hours after the Dodsons had moved out — the building collapsed in a thunderous roar of splitting timbers and breaking glass that woke up people throughout the village. It was a dramatic end of an era.